Though they originate from the Caucasus and Anatolia, these juicy fruits grow worldwide these days and are among the most popular of fruits. 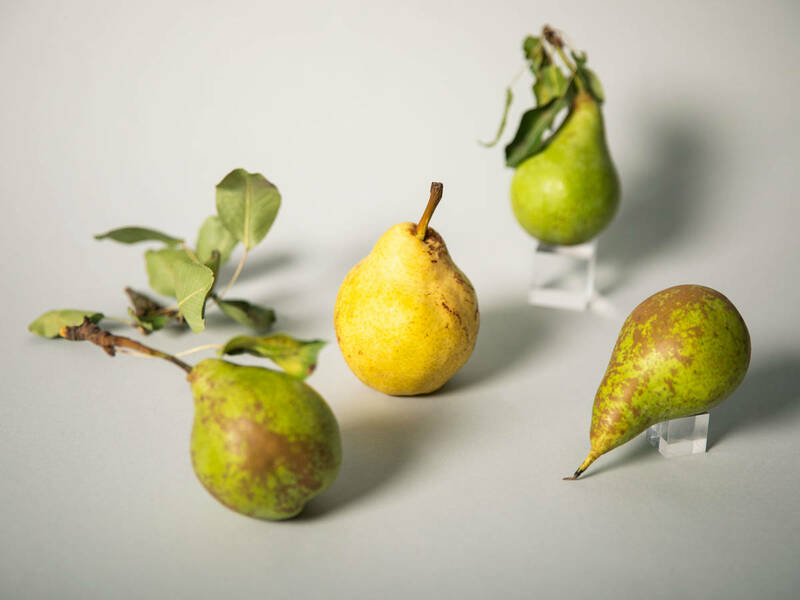 Though there are approximately 2,500 species of pear, the most common are dessert pears, cider pears, and cooking pears, while the most famous varieties in their own right would probably be the bulbous Williams pear, teardrop-shaped Abate, and the juicy Asian pear. Dessert pears are your classic kind, that you can find in the supermarket and bite straight into, while cooking pears are basically inedible when raw and cider pears are used to produce juice and cider, hence their name. Depending on the variety, color, shape, juice content, and aroma differ greatly. The first summer pears are available in July and further variates are available until November. Since the ripe fruits are very sensitive, pears stocked in supermarkets are harvested unripe. But don’t worry, they reach full sweetness and aroma in only a few days at room temperature—if you want to learn more about ripening fruits, or which fruits ripen up after being picked, see our article on the subject. When ripe, they should be stored in the refrigerator at 0°C to 5°C for a maximum of 3 days. When stored in a cool and dark place, pears can be kept much longer, even up to 2 months. If you want to freeze pears, you’ll need to first make them into a puree or compote, since whole fruits don’t freeze well. 3. When are pears ripe? And ideal pear is firm, but not too hard, to touch and has smooth, undamaged skin. Soft pears with brown spots are already overripe. However, these stains shouldn’t be confused with the typical rust-like patches of some varieties like Bosc or Comice. Whether incredibly juicy, tender, or with an almost sandy texture—there are as many types of pears as there are flavors. You won’t know until you try! 4. How healthy are pears? Whether you want to eat fresh pears, preserve, or dry them—there are many good reasons to take a bite. Pears are rich in vitamins such as vitamin A, B and C, as well as a moderate amount of potassium, magnesium, calcium, phosphorus, zinc, copper, and iodine—making them ideal for preparing for the upcoming flu season. Unlike apples, they are low in acid, and therefore very friendly to your stomach and teeth. It’s clear to see why the pear is so popular: With an average of 115 calories, the pear is a light source of energy. Thanks to their containing carbohydrates and dietary fiber, pears are nourishing and can stimulate your digestion—a real plus for all diets. Grandma's advice to eat fruit and veg with the skin on, is more than valid for the pear, as this is where you’ll find the most vitamins. So, grab yourself one of these sweet autumn treasures!